SANTA TERESA, New Mexico – The sign flashes red, day and night, in English and in Spanish: “Be Prepared to Stop,” a warning to the thousands of vehicles and people passing through the Santa Teresa Port of Entry. Here in this stretch of the Chihuahuan Desert, the U.S. Department of Homeland Security is expediting the construction of a border wall, acting on the campaign promises of President Donald Trump. DHS Secretary Kirstjen Nielsen has waived more than 20 environmental laws to allow for the building of the wall, calling it necessary for “border security and the detection and prevention of illegal entry into the United States,” according to the waiver. The laws set aside include the Endangered Species Act, the Clean Air Act, the National Environmental Policy Act and the Native American Graves Protection and Repatriation Act. The waiver, issued Jan. 22, covers a 20-mile stretch of border starting at the Santa Teresa Port of Entry and moving westward. Existing vehicle barriers will be turned into a more formidable wall of tall steel bollards. Ciudad Juarez, Mexico, with a population of about 2 million, sits just across the border. 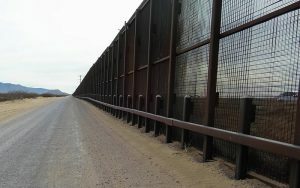 DHS has said the highly populated area is reason to expedite the border wall, in part, because “the eastern portion of the project area includes developed areas where illegal aliens can quickly blend into the population and have ready access to roads, highways, and other infrastructure,” according to the DHS waiver. Groups across the country have publicly denounced the wall, which Trump envisions stretching 1,950 miles from Texas to California. The Center for Biological Diversity in Tucson filed suit March 22 challenging the waivers. Laiken Jordahl of the center said DHS does not have the authority to waive environmental laws. The waiver allows construction to begin along the New Mexico border without considering its impact on air, clean water, public lands and endangered wildlife, the Center for Biological Diversity said. In its waiver, DHS notes the El Paso sector of the border, which includes Santa Teresa, is regularly confronting illegal immigration and drug trafficking. In 2016, Border Patrol agents reported apprehensions of 25,634 people in the El Paso sector; in contrast, agents in the Rio Grande Valley sector reported at least 186,830 apprehensions. “In order to justify the waiver of law,” Jordahl said, “they argued that this was a priority area of high cross-border activity. My experiences, actually spending time out there, were quite contrary to that idea. From my impression, there was very little traffic. Last year, the Center for Biological Diversity also sued the Trump administration for using a similar waiver to replace border walls south of San Diego. According to data from U.S. Customs and Border Protection, in February there was a 2.4 percent increase in individuals apprehended crossing the Southwestern border between established ports. The Chihuahuan Desert stretches from west Texas to eastern Arizona. If built, the reinforced border wall would cut through a vast expanse of yucca, mesquite trees, mountain lions, bobcats, wolves, lizards, mule deer and many other animals. 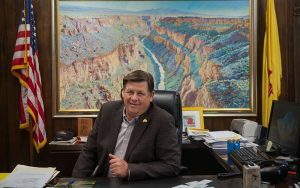 Aubrey Dunn, the New Mexico state land commissioner, also has spoken out against the border wall, but for another reason: The federal government has not compensated New Mexico for the use of state trust land. The 1-mile stretch of state trust land is part of the site proposed for the border wall. The land office is responsible for 9 million acres of surface and 13 million acres of subsurface land, according to its website. Revenue generated by this land goes to schools, hospitals, universities and other public institutions in New Mexico. 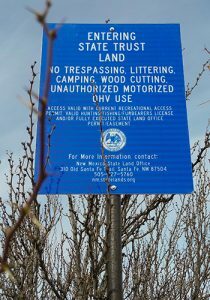 The state’s land trust was designated by Congress under the Ferguson Act of 1898. DHS needs to fill out an application and apply. 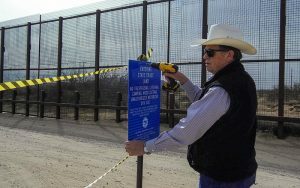 Dunn has installed “No trespassing” signs at the edge of the state-owned land to keep Border Patrol agents away. “I think the Department of Homeland Security wants to work with us and get an easement in place,” Dunn said. DHS officials said they would like to meet with New Mexico land commissioners in April.